Why is Wedding Photography So Expensive? What is Documentary Wedding Photography? Deer Park Hall is a stunning venue that sits right on the Worcestershire/Gloucestershire border, in miles of rolling countryside. For as long as I've been a wedding photographer, Deer Park have had a licence for conducting ceremonies in their panelled room, a beautiful wood panelled room that features a mezzanine gallery above. In 2017, Deer Park Hall was awarded it's licence to hold civil ceremonies outdoors, on Lambs Leap Lawn, with the ceremony itself taking place inside the venue's large garden pagoda. I was one of the very first photographers to shoot an outdoor wedding here, so there was naturally a bit of a learning curve for everyone involved. To start with, the roof on the pagoda is a little low, meaning if I were to photograph from the back of the lawn, the bride and groom's heads would be missing from the photos - which is far from the ideal! Luckily I knew the two registrars for this wedding (I know most of them in the county fairly well) and I asked if I could position myself inside the pagoda for the ceremony itself. They agreed, only it was until the bride made her entrance and we all stood up, that we realised that there really wasn't enough space for us all inside! I was squashed between David, the registrar conducting the ceremony, and one of the witnesses who were required to make the ceremony legal. I was stood there with both arms tucked into my side and the camera pressed hard against my face, whilst the whole time leaning backwards as there was a table in front of me and a low seat to my rear! It was like having a massive family meal at Christmas and having 12 people present on a table that was only intended to seat 4! The bride made a stunning entrance, and walked, assisted by her father, the length of Lambs Leap Lawn and made her way into the pagoda for the ceremony. The groom, a firefighter, toughened by years of service became quite emotional and shed a tear, which was incredibly moving. 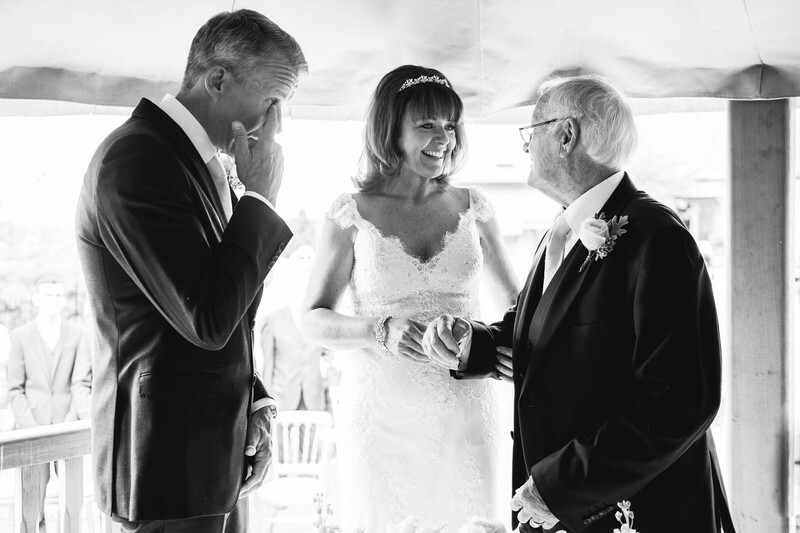 I absolutely adore this photo - not only is the groom showing his emotional side, but just look at how happy the bride is too. It genuinely warms my heart. Location: Deer Park Hall, Worcestershire. Keywords: Documentary wedding photography (375).